In New York City on March 8, three very big and important metal shows were simultaneously going on around Manhattan (yes, all in the same borough). One included one of the most-sought-after bands to reunite this decade: Coalesce. They played with the southern doom masters Harvey Milk. The other show included Alice In Chains, another giant reunion that most people didn't expect to ever happen after Layne Staley's passing. 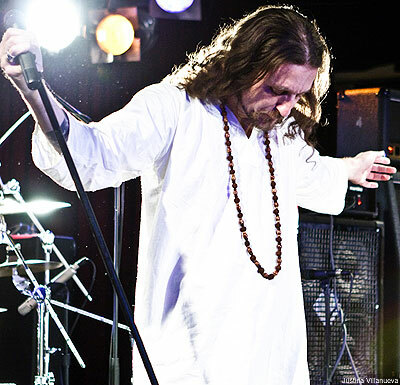 The third show was Orphaned Land's first New York City gig. This Noisecreep writer went to the third one. No matter how much I love Harvey Milk and Alice in Chains, it's a rare opportunity to see Isreali metallers combine traditional Arabian folk music with prog metal. With the lights down and intro music playing, BB Kings waited anxiously for the band to finally get on stage. A guy behind me screamed "Orphaned Land" with all his might. Then the crowd joined in. "You see that. I started a chant," he told his friends. "Come on. Are you ready to party?" frontman Kobi Farhi said to the crowd. With everyone clapping their hands in the air, I thought I was at a hip-hop show for a second. Except this 'hip-hop show' had one of the most diverse audiences I've ever seen. "I guess for most of you this is the first Middle Eastern band you have ever seen ... we feel at home here. So thank you," Farhi said about the crowd's response to the band. Their New York City stop was one of only three U.S. dates. March 14 they play Bottom Lounge in Chicago. March 17 they play Red 7 in Austin as part of South by Southwest. Check out Orphaned Land's latest release 'The Never Ending Way of ORwarriOR' out on Century Media.